Aniwaa Owusu Obeng, PharmD, is Assistant Professor of General Internal Medicine and Clinical Pharmacogenomics Coordinator at the Charles Bronfman Institute for Personalized Medicine, Icahn School of Medicine at Mount Sinai in New York. Dr. Obeng is also currently adjunct experiential faculty with Albany College of Pharmacy and Health Sciences and Long Island University Arnold and Marie Schwartz College of Pharmacy. Dr. Obeng earned her doctorate of pharmacy from Albany College of Pharmacy and Health Sciences in 2011 followed by residencies at the Bronx Lebanon Hospital Center and the University of Florida, the latter as the inaugural resident for the UF Pharmacogenomics Pharmacy Residency (PGY2) program. 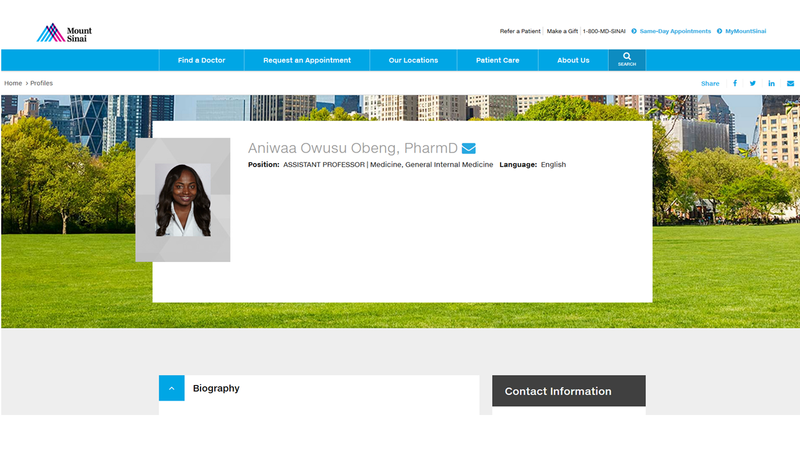 At Mount Sinai, Dr. Obeng's current research interests include translational pharmacogenomics, and she is active is several relevant consortia including the electronic MEdical Records & GEnomics (eMERGE) network, the Implementing GeNomics In pracTicE (IGNITE), and Clinical Pharmacogenomics Implementation Consortium (CPIC), among others. Cavallari, LH, Van Driest, SL, Prows, CA, Bishop, JR, Limdi, NA, Pratt, VM, Ramsey, LB, Smith, DM, Tuteja, S, Duong, BQ et al.. Multi-site investigation of strategies for the clinical implementation of CYP2D6 genotyping to guide drug prescribing. Genet. Med. 2019; : . PubMed PMID:30894703 . Hauser, D, Obeng, AO, Fei, K, Ramos, MA, Horowitz, CR. Views Of Primary Care Providers On Testing Patients For Genetic Risks For Common Chronic Diseases. Health Aff (Millwood) 2018; 37 (5): 793-800. PubMed PMID:29733703 . Rasmussen-Torvik, LJ, Almoguera, B, Doheny, KF, Freimuth, RR, Gordon, AS, Hakonarson, H, Hawkins, JB, Husami, A, Ivacic, LC, Kullo, IJ et al.. Concordance between Research Sequencing and Clinical Pharmacogenetic Genotyping in the eMERGE-PGx Study. J Mol Diagn 2017; 19 (4): 561-566. PubMed PMID:28502727 PubMed Central PMC5500823. Cavallari, LH, Beitelshees, AL, Blake, KV, Dressler, LG, Duarte, JD, Elsey, A, Eichmeyer, JN, Empey, PE, Franciosi, JP, Hicks, JK et al.. The IGNITE Pharmacogenetics Working Group: An Opportunity for Building Evidence with Pharmacogenetic Implementation in a Real-World Setting. Clin Transl Sci 2017; 10 (3): 143-146. PubMed PMID:28294551 PubMed Central PMC5421730. Moriyama, B, Obeng, AO, Barbarino, J, Penzak, SR, Henning, SA, Scott, SA, Agúndez, J, Wingard, JR, McLeod, HL, Klein, TE et al.. Clinical Pharmacogenetics Implementation Consortium (CPIC) Guidelines for CYP2C19 and Voriconazole Therapy. Clin. Pharmacol. Ther. 2017; 102 (1): 45-51. PubMed PMID:27981572 PubMed Central PMC5474211. Cavallari, LH, Obeng, AO. Genetic Determinants of P2Y12 Inhibitors and Clinical Implications. Interv Cardiol Clin 2017; 6 (1): 141-149. PubMed PMID:27886818 PubMed Central PMC5134418. Obeng, AO, Kaszemacher, T, Abul-Husn, NS, Gottesman, O, Vega, A, Waite, E, Myers, K, Cho, J, Bottinger, EP, Ellis, SB et al.. Implementing Algorithm-Guided Warfarin Dosing in an Ethnically Diverse Patient Population Using Electronic Health Records and Preemptive CYP2C9 and VKORC1 Genetic Testing. Clin. Pharmacol. Ther. 2016; 100 (5): 427-430. PubMed PMID:27393744 PubMed Central PMC5638436. Overby, CL, Erwin, AL, Abul-Husn, NS, Ellis, SB, Scott, SA, Obeng, AO, Kannry, JL, Hripcsak, G, Bottinger, EP, Gottesman, O et al.. Physician Attitudes toward Adopting Genome-Guided Prescribing through Clinical Decision Support. J Pers Med 2014; 4 (1): 35-49. PubMed PMID:25562141 PubMed Central PMC4251406. Weitzel, KW, Elsey, AR, Langaee, TY, Burkley, B, Nessl, DR, Obeng, AO, Staley, BJ, Dong, HJ, Allan, RW, Liu, JF et al.. Clinical pharmacogenetics implementation: approaches, successes, and challenges. Am J Med Genet C Semin Med Genet 2014; 166C (1): 56-67. PubMed PMID:24616371 PubMed Central PMC4076109.